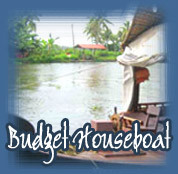 Kerala Boat house is the finest boat house in Kerala (A unit of Kerala canoe tourism houseboats). A floating holiday on the backwaters highway with Kerala boat house is perhaps the most enchanting holiday experience in the world. Kerala boat house Security: - Adequate numbers of buoys are provided and so are fire buckets. The boat house has plentiful supply of purified water. Clean, good quality linen, blankets, towels etc. Eco-Friendly Kerala boat house - Solid wastes and sewage are not directly discharged into the water, bio-chemical alternatives are provided and for energy requirements solar power is used in our boat house. 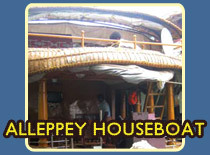 Kerala boathouse Records: - Logbooks and tourist records are updated regularly and the Boat house has a valid license. Kerala boat house staff: - Uniformed experienced staff holding valuable conversant in English mans the boat house. The services of professional cooks are available on the boat house. Kerala boat house staffs are very friendly & help full. 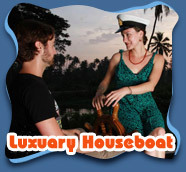 Kerala boat house offers attractive Kerala boat house package with premium range of services. Kerala boat house are ideal for the honeymoon couples, we are designing attractive Kerala boat house Honey moon package..
Alleppey known as the Venice of the East, Alleppey is an important backwater destination. Don't mistake this for a simple small town! Alleppey or Alappuzha. Kerala boat house welcome the entire traveler to enjoy the green beauty of the Alleppey backwaters.